Activia Yogurt Products with Added Probiotic - Are They Good for You? Activia is a probiotic yogurt or drink that is marketed by the Danone North America company (Dannon in the US). The January, 2019 marketing says"...Activia® may help reduce the frequency of minor digestive discomfort. Consume twice a day for two weeks as part of a balanced diet and healthy lifestyle. Minor digestive discomfort includes bloating, gas, abdominal discomfort & rumbling." There were a few lawsuits (with compensation available) filed in Canada and the US against Dannon for false claims about these products in past years. As a result, Dannon softened its language and took specific health claims off the product. What Probiotics are in Activia? All Activia products contain the beneficial bacteria B. lactis DN-173010/CNCM I-2494, scientifically known as Bifidobacterium animalis subsp. lactis DN-173010. In the US, Dannon previously called this probiotic "Bifidus Regularis". For more information on Bifidus Regularis and on its various names in other countries, click here. 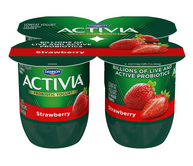 Activia is considered to be a probiotic yogurt or probiotic smoothie because according to the Dannon website, it contains a sufficient quantity of live probiotic microbes to deliver health benefits. They say that it is suitable for the entire family. Dannon does not state exactly how many CFU's of B. lactis DN-173010 are in the yogurt items on the product label, but they do say that regular consumption is advised because the bacterium does not stay in the colon and is eliminated in the stools along with other bacteria after 2-3 weeks once you stop eating it. Since the Activia yogurt from Dannon is a yogurt product, it also contains the required yogurt cultures L. bulgaricus and S. thermophilus as live cultures. What Kind of a Yogurt Product Is It ? There are many different Activia products around the world, so the ingredients will vary according to country. Because of this, I'm just going to comment in general terms about those in the United States. Please always read ingredients lists before you buy and consume any product. Here is a comparison of the different products in the strawberry flavor, when available. Ingredients in bold are major allergens or questionable substances. Cultured Grade A Non Fat Milk, Strawberries, Water, Modified Food Starch, Contains Less Than 1% Of Inulin, Acacia Gum, Modified Corn Starch, Kosher Gelatin, Pectin, Natural Flavor, Carmine (For Color), Malic Acid, Sucralose, Calcium Lactate, Xanthan Gum, Acesulfame Potassium. Cultured Grade A Reduced Fat Milk, Cane Sugar, Water, Strawberries, Inulin, Modified Food Starch, Contains Less Than 1% Of Rolled White Wheat Flakes, Red Wheat Bran, Milk Protein Concentrate, Kosher Gelatin, Rolled Oats, Fruit Juice And Vegetable Juice (For Color), Agar Agar, Citric Acid, Natural Flavors, Sodium Citrate, Vitamin D3. Cultured Grade A Reduced Fat Milk, Water, Cane Sugar, Strawberries, Raspberry Puree, Modified Food Starch, Contains Less than 1% of Milk Protein Concentrate, Kosher Gelatin, Natural Flavors, Lactic Acid, Agar Agar, Carrageenan, Vegetable Juice and Beta Carotene (For Color), Sodium Citrate, Xanthan Gum, Stevia Leaf Extract, Vitamin D3, Malic Acid. Cultured Grade A Reduced Fat Milk, Water, Cane Sugar, Strawberries, Modified Food Starch, Contains Less Than 1% Of Milk Protein Concentrate, Kosher Gelatin, Fruit And Vegetable Juice (For Color), Natural Flavors, Lactase, Agar Agar, Carrageenan, Calcium Lactate, Lactic Acid, Milk Calcium, Vitamin D3. Cultured Reduced Fat Milk, Water, Sugar, Milk Protein Concentrate, Fructose, Contains Less than 1% of Strawberry Puree, Modified Corn Starch, Agar Agar, Natural Flavor, Citric Acid, Black Carrot Juice Concentrate (For Color), Sodium Citrate, Potassium Sorbate (To Maintain Freshness), Xanthan Gum, Carob Bean Gum. Cultured Grade A Reduced Fat Milk, Cane Sugar, Water, Contains Less Than 1% Of Acacia Gum, Modified Food Starch, Natural Flavors, Vegetable Juice (For Color), Sodium Citrate, Malic Acid, Vitamin D3. Cultured Grade A reduced fat milk, cane sugar, chicory root fiber, water, contains less than 1% of acacia gum, ginger, pectin, natural flavors, lemon juice concentrate, Vitamin D3. Is Activia Right for You ? Nutritional consultations with me can help decide if any of these Dannon products are right for you or if there are better options for your circumstances, especially if you are eating it for the digestive complaints of bloating, gas, discomfort and rumbling. To begin with, none of the products are a plain yogurt. Each has either added sugar or artificial sweeteners. Most have some sort of modified food starch or corn starch in them. Some of the yogurts say that they now contain non-GMO ingredients, but the drinks had no such statement. My guess is that any cornstarch not declared non-GMO is probably genetically modified (GMO) since most corn in the US is GMO, unless stated otherwise. Additionally, the milk used probably comes from cows treated with rBGH (recombinant bovine growth hormone) since the products do not state otherwise. In case you aren't familiar with GMO's - genetically modified ingredients - you can find out more information here. My opinion is that since most of the corn, canola, cottonseed and soy products made in the US are genetically-modified, unless a product specifically says it does not contain GMO versions of those crops, it's safe to assume that it does. My book, Probiotics: How to Use Them to Your Advantage, has more information on GMO's and gut health. Return to the page about whole food sources of probiotics.